If you are searching for ‘Asbestos Removal Tunbridge Wells’ then perhaps consider All About Asbestos, the leading asbestos removal company in Kent. 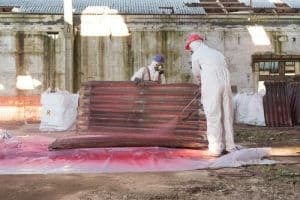 Choosing the right asbestos remediation company can often be hard as you want to ensure that the work is going to be carried out to a high standard. At All About Asbestos, we work with all of our customers to ensure a great working relationship whilst we carry out the work you require. We have undertaken a variety of different asbestos removal jobs in commercial, domestic and industrial settings. We also have an excellent team who will ensure your job is completed efficiently from start to finish. If you are looking for a reliable and high-quality asbestos removal then look no further. Call us today on 01843 600765 for more information on our services! Although asbestos was permanently banned from the UK nearly 20 years ago, it is still present in many buildings and homes across the country. Asbestos can be found in many areas of a building such as pipes, insulation, artex ceilings and other hidden areas. Therefore, it is still a common occurrence and should be taken with caution, especially if you own an old property. Houses that were built before 1999 may possibly contain asbestos, as this was the year the final type of asbestos was banned in the UK. Asbestos fibres are microscopic and very small, which is why they are so hard to identify. They can be up to 2000 times thinner than a human hair! It is also widely known that asbestos can cause many illnesses such as mesothelioma, lung cancer and other respiratory-related diseases. It is always recommended that you check to confirm if there is asbestos present as there can sometimes be fatal consequences if a human inhales the fibres. If you are concerned about the asbestos in your property please do not hesitate to get in contact with the team at All About Asbestos. Asbestos is known to be dangerous across many different areas, whether that be in a domestic house or an industrial workplace. It is estimated that asbestos kills nearly 5000 workers every year, which is a worrying statistic. This is most common in the construction and building industries. Asbestos is normally found in three main forms known as amosite (brown asbestos), crocidolite (blue asbestos) and chrysotile (white asbestos.) Brown and blue asbestos are typically regarded as the most dangerous, as these types have been banned since 1985. Chrysotile has only been banned in the UK since 1999, so it is the most commonly found in today’s buildings. Many different regulations have been put into place due to the danger that asbestos poses, so it’s important that these are followed in the workplace and elsewhere. As an asbestos remediation company, we aim to remove dangerous asbestos from homes and commercial buildings. Even though asbestos has not actively been used for almost 20 years, it can still be found in many different places. It is found in both residential and industrial buildings that were built before the year 2000. This also includes buildings that were refurbished during this time as the materials may have contained asbestos. It is important that you protect yourself immediately. If you are concerned about asbestos or believe there is asbestos located in your home or workplace, please let someone know immediately. We would recommend that you cross off the area and stay well away from the potential asbestos, and ensure that no other person comes into contact with it. You should then make a call to our team at All About Asbestos, who will take down your details. We always complete a comprehensive survey and bulk sample at the property before assuming anything, which we will promptly book at a time that suits you. Asbestos can be found in many different areas of a home. The most common places you will find asbestos are within the piping, insulation, ceiling and cement. It is unlikely that your house will contain asbestos unless it was built before the 2000s. When asbestos is friable, it is in a powdered form. This makes it a lot more dangerous to a person, as powdered asbestos is much easier to inhale. Friable asbestos needs to be managed properly in order to prevent any harm, and often needs to be removed from the property entirely. This is where the asbestos is much more compact. Non-friable asbestos is not easily released into the air and therefore poses less of a risk in comparison to friable asbestos. This normally makes the removal costs cheaper, and sometimes it may not be necessary to remove the asbestos at all. We do not remove the asbestos immediately as we need to ensure it is absolutely necessary to remove it. It is important that the risk of the asbestos in your property is assessed and confirmed by a professional so that the right action can be taken to protect the safety of all inhabitants of that property. All About Asbestos has over 30 years of experience in the asbestos industry and have been involved in many asbestos removal projects, both big and small. If you suspect that there is asbestos in your home then do not panic. Firstly, you should ensure that you keep everyone away from the suspected area in order to protect their safety. You should then contact your local asbestos specialists and book in for an asbestos survey. An asbestos survey will involve a variety of different testing and identification processes so that the team can accurately identify the asbestos in your property. Once the surveying and samples have been completed they will go back for testing in order to confirm it. You will also receive a detailed report after the service which will include asbestos-containing materials, the condition of ACMs, risk assessment, sample analysis and many other details that will help you understand the results. If the asbestos in your property is deemed to be dangerous and requires some type of removal, then you will need to get this booked in order to prevent further risk. This can be booked by our team at All About Asbestos, who will take care of the entire process for you. An asbestos removal can often be complicated and therefore we conform to the highest standards possible during every single job. Once the asbestos has been removed carefully by our team, the asbestos waste will be disposed of by our team. For more information on our asbestos services in Tunbridge Wells, please give us a call on 01843 600765. One of our friendly team will be able to advise you further!